Bruxism causes you to grind, clench, and gnash your teeth. This may occur both during the day (when you are likely to unconsciously clench your teeth together), and at night (when you grind your teeth during sleep). Oftentimes, sleep bruxism is linked to other sleep-related issues, such as snoring and sleep apnoea. Mild cases of bruxism may not require any kind of treatment at all, but more severe cases can result in jaw disorders, damage to your teeth, and severe headaches. Unfortunately, you probably won’t be aware that you have sleep bruxism until complications arise. So, it’s important to be aware of its symptoms, and to have regular dental check-ups. 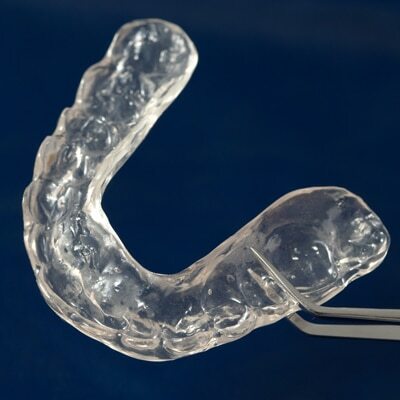 Bruxism splints are most commonly used to treat a variety of disorders, many of which manifest themselves through the grinding, clenching or gnashing of teeth. Made from soft rubber (silicone), bruxism splints are a little bit like a mouth guard. They even out the pressure across your jaw and create a physical barrier between your upper and lower teeth, which protects all of your teeth from further damage. They also reduce grinding noises that you make during the night while you sleep. When it comes to bruxism treatment, we understand that individual, tailored treatment plans are extremely important. We always start with a careful consultation and examination of all your teeth so that we have a complete understanding of your unique needs and any affects that bruxism or sleep apnoea are having on your teeth. An experienced dentist (like the team at dhealth Dentistry) should always fit and make bruxism splints to ensure a proper fit. Generic mouth guards and splints, that aren’t tailored to the shape of your mouth, tend to be too thick and Ill-fitting, resulting in even greater damage to your teeth. For every 1mm the teeth at the back of your mouth (molars) are separated, your front teeth then separate by a factor of three, pushing all of your teeth out of alignment. If in doubt, pop in for a visit; we’re always happy to provide advice. Although bruxism splints may help reduce muscle activity in your jaw at night, they’re only able to control the condition, not cure the problem. We suggest to all our patients that they seek further treatment for any underlying problems, such as stress or anxiety, that are the root cause of the problem. Why Opt for Bruxism Splints to prevent teeth grinding? Bruxism splints can help to reduce the movement and activity of the muscles in your jaw while you sleep, reducing the likelihood of waking up tired or with a headache. Bruxism splints protect your teeth from the effects of grinding, clenching and gnashing, reducing the likelihood of chipped or broken teeth. This reduces your dental bills long-term. Bruxism splints can be the perfect way to reduce the side effects of a range of sleep disorders, while you seek further treatment for the root cause of the problem.